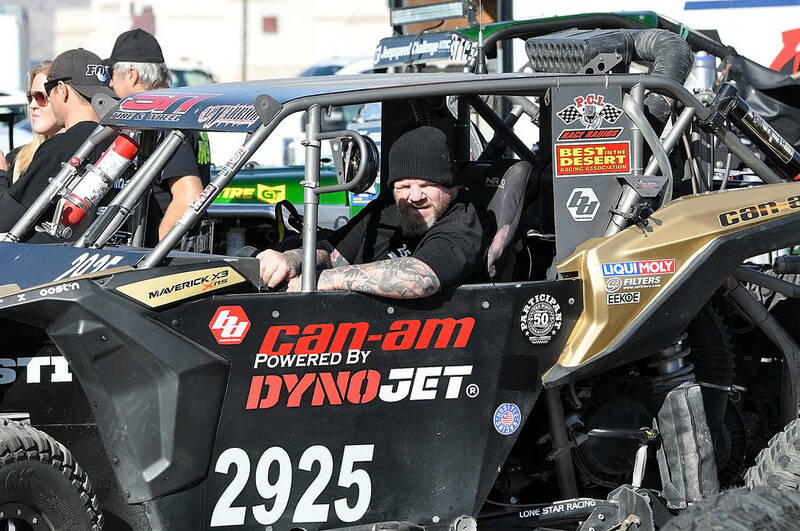 Anthony Terzo sat in his Trick Truck on Friday, recalling his first unfortunate attempt at running the Pahrump Nugget 250. 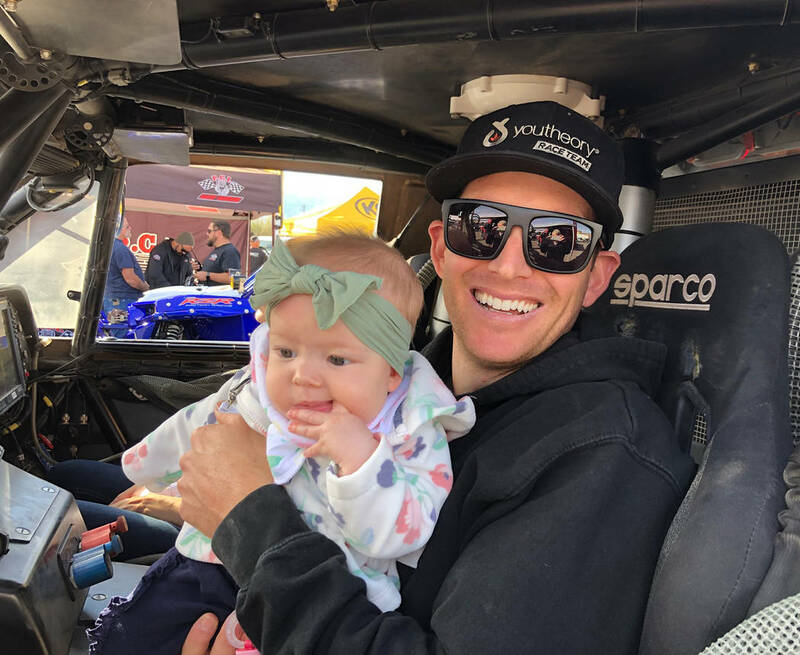 Tom Rysinski/Pahrump Valley Times Trick Truck driver Anthony Terzo of Irvine, California, sits Friday with his 6-month-old daughter Masyn while waiting for a technical inspection of his vehicle for the Pahrump Nugget 250. Horace Langford Jr./Pahrump Valley Times Jeremiah Drew of Las Vegas sits in his UTV on Friday in the parking lot of the Pahrump Nugget waiting for his turn for a technical inspection before the Pahrump Nugget 250. 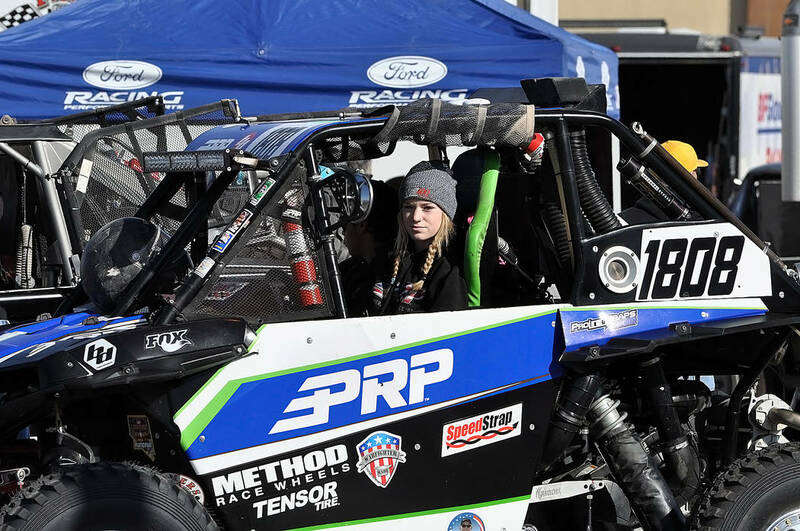 Horace Langford Jr./Pahrump Valley Times Madeline Wedeking of Temecula, California, in her P Class UTV, sits among dozens of drivers waiting for technical inspection Friday in the parking lot of the Pahrump Nugget. But this year, Terzo brought along a good-luck charm not available to him a year ago. Sitting in line for technical inspections in the Pahrump Nugget parking lot, Terzo had his 6-month-old daughter, Masyn, sitting happily on his lap. While Masyn was happily waiting for her dad’s truck to be inspected, just outside the parking lot plenty of people were waiting just to make a turn. Turning on and off Highway 160 required patience because of the increased traffic in front of the Pahrump Nugget, as roughly 3,000 visitors were expected in Pahrump for the race. Although Terzo missed out on the Pahrump Nugget 250 last year, he did get a good look at the course in advance of Saturday’s race. Terzo was excited to tackle the course for Youtheory Racing, competing in the Trick Truck division. The Pahrump Nugget 250 was the sixth race his team has run this year. “We don’t race the Baja races, so we’re able to make the full season of Best in the Desert,” he said. Right behind him, Jeff Scott of SpeedLee Racing was in Pahrump for the first time. While Terzo was going to compete in a Trick Truck, Scott’s SpeedLee Racing vehicle had more specific limitations. Scott’s team has been racing off-road since 2010, although this is their first season driving a truck. Terzo and Scott were waiting for technical inspections Friday in a very crowded Pahrump Nugget parking lot. With race organizers and vendors on both sides of them, the drivers waited as the line snaked through the lot. “With tech inspections they’re looking for safety, so they’re checking our seat belts, they’re checking our driver suits, they’re checking that we have a fire extinguisher, we have a traffic triangle, siren, and I think that’s it,” Terzo said. Terzo finished eighth in the race, fifth among Trick Trucks, running the course in 4 hours, 9 minutes, 15.721 seconds. SpeedLee Racing’s Race Ritchie finished 38th overall in 4:49.35.656, which was good for 10th among 6100 series trucks. The overall winner was Kevin Thompson of New Braunfels, Texas, who finished in 3:38.47.221 in a Trick Truck. Of the 147 drivers who entered the race, 36 did not finish. The race is not scheduled to return to Pahrump in 2019.